We have the same, 2015 38RL, and full time in it. Our Redwood has been a great rig for us, very reliable and still one of the best looking rigs wherever we go. Weve done about 25,000 miles in 1 year and getting ready to do another 5,000 next month. 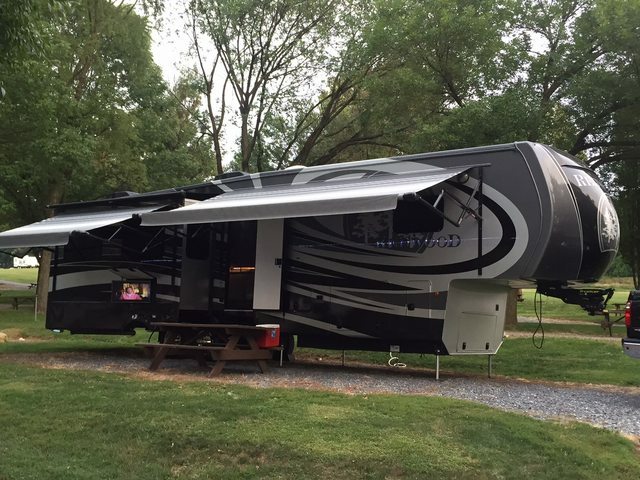 We've looked at a lot of different models at RV shows and haven't found anything we like better! Welcome! The 5500 will be a nice genset for that Redwood. Tailor made! Welcome to Redwood RV'ing and to the forum. A lot of good folks on the forum that are knowledgeable and will to help if you have questions. Welcome! What part of the country do you call home? Welcome to the Redwood community. That is a great looking rig. This form is a great resource for troubleshooting, repairs, travel and learning about your Redwood. I have a "16" 38RL and we LOVE IT.... For the most part it has been trouble free. The small issues we had the dealer was able to handle in a timely manner..
We added an Onan 6.5 last year, I was debating between the 5.5 and the 6.5.. the Onan tech told me that the 6.5 would not work as hard, so I would use less LP... Sounded right to me ??? So I went with it..